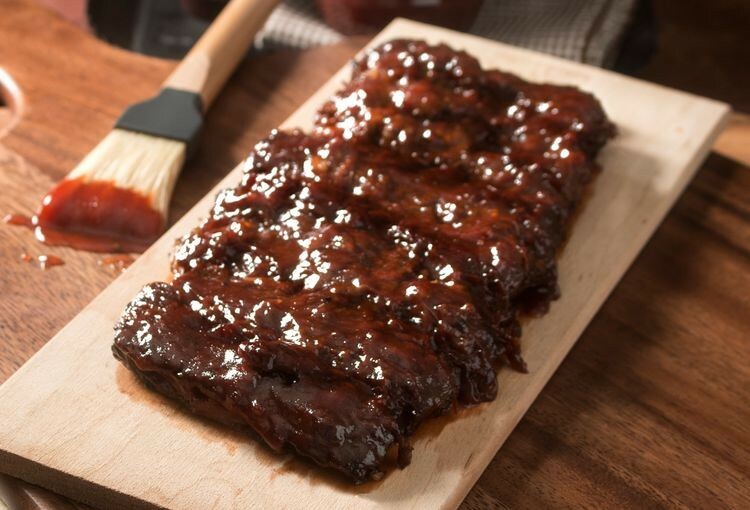 Moist, tender and lip-smackingly delicious, Bubba Q's Baby Back Rib Steak in Sauce has all the over-the-top taste and flavor of ribs of the best barbecue joints--without the bones or the mess. Grill or microwave these deboned ribs, then grab a knife and fork and dig in! Don’t eat them too fast or you’ll get messy, eat them nice and slow to enjoy every bite! Available in packs of 1, 2, 4, or 6. Available in either 10 or 18 oz. Rich and full of flavor! For best results thaw under frigeration. Use within 5 - 7 days. Grill: Remove Rib Steak from package. Place on grill at medium to high temperature. Cook 3-5 minutes per side (Use Spatula to turn) until heated through. Conventional Oven: Preheat Oven to 375 Degrees. Remove Rib Steak from package and place on a cookie sheet. Place in oven for 12 – 15 minutes (or until heated through). Microwave: Remove Rib Steak from package, place on microwave safe plate. Heat on high for 1 minute, 45 Seconds (or until heated through). For the amount of work to prepare (NONE) these ribs are amazing! I put these on Hawaiian bread and made sliders. AMAZING! Love the fact they're boneless. The man went from breaking bones and tenderizing quarterbacks .. to making tender boneless ribs. I have only tried the original and honey bbq. Hoping to try something that brings back the heat of the Silver Rush. Can't believe it. They were everything you described! I will definitely reorder. Delicious AND easy!! !